The Arboretum is located in Southern Finland, in Elimäki, Kouvola, by highway 6 (25 km south from the centre of Kouvola and 115 km northeast from Helsinki). Get driving instruction from GoogleMaps to Mustilantie 57, 47200 Elimäki, Finland. 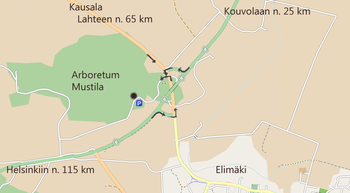 From Helsinki take route E18 towards Kotka and exit 65 to highway 6 towards Kouvola. From Lahti you can take highway 12 towads Kouvola, and before Kouvola turn to to highway 6 towards Helsinki (or take a shortcut using landscape route from Kausala through Haapakimola to Elimäki). From Kotka and Hamina the most direct route goes through the village of Anjala. Express buses travelling highway 6 now stop regularly at Mustila, ca. 300 m from the arboretum. The nearest train station is in Kouvola about 25 km away. Local and Express buses run the distance on a regular basis.